There is one good, middle aged man in my neighborhood who was born with a certain degree of disability due to which he has numerous health problems. I didn’t even know he existed, nor that he lived just several hundred meters away from me, because only in the block of adjacent buildings where I stay there are more or less 1,000 souls, not to mention that this whole area of the town with these same buildings consists of 13-14 such identical blocks. In reality, we are one entire little town by itself, condensed in not that much vast land area, there are so many people living literally ones on the top of others packed in apartments with mostly insufficient number of square meters yet you rarely know the person living next door, not to mention somebody from a different floor or in a different building within the same block. It wasn’t like that in the past, not even in that not very distant past when we moved in here a bit more than 30 years ago. People cared more about other people and life wasn’t so much about material possession and personal vanity as it is now, I sincerely and dearly miss that country called Yugoslavia I was born in. If I were still living in Yugoslavia (and I’m not, even though I haven’t moved an inch away in these last nearly 4 decades), the man from the beginning of this story would be in much better shape today. He would have completely free health care, some personal income due to his very legitimate disability issues, access to daily meals for people with income problems. He would have some dignity in this life and more people on the block would know he existed and offered some help, because social services would work on his integration in the community. In his twenties, he used to live in Yugoslavia as well, and his father’s company helped him the best they could by letting him work in the company’s kitchen for their workers. He carried things around and peeled some vegetables, he had some little income and full insurance – those were the best days in his little unfortunate life, days before the world slowly but definitely started tumbling down on him. Yugoslavia got torn up in pieces, swallowed by its own inhabitants who turned against each others, failing to understand that the consequences of these actions would harm only themselves and no one else. His dad’s company first suffered the beginning of a bad economical crisis. Then his dad passed away, failing to buy off their living space from the state in the midst of that crazy stellar inflation, as we all did and thus literally saved ourselves. His dad’s company eventually had to be restructured in the process of privatization, obligatory in the transition towards capitalism, but nothing prevented bankruptcy from happening. He lost his little job and remained with his mom who inherited his dad’s retirement money, as she didn’t have any income of her own. Life went on while his mom could take care of their lives in every possible sense, but in the end she passed away too several years ago. And this is when life stopped. He remained completely alone, lost, in Serbia now, with no means to live this life and expired ID, hidden among us with no electricity, with unpaid bills and no food for days in a row. He can do some things, but he needs to be told exactly what to do and he has to be partially supervised, which makes it almost impossible for him to find some kind of stable work position in this country. I found about him for the first time when an old lady involved in an organization for saving stray dogs moved in with him to help him out in exchange for the accommodation for her and the dogs she took care of. Things got better for a while, bills got payed again, there was some food on the table every day… but the lady’s age is such that she progressively needed more and more help for herself, and somewhere by the time my dad declined she left the man’s place as it seems for good. Dogs were took over by the organization, the lady was accepted by some relatives and he is alone again, growing older himself and becoming more and more helpless as time goes by. My mom helps him with food as always in these last years as much as she can, but life has hanged for us as well. I remember that in the middle of my worst panic ridden despair when I didn’t go anywhere, I secretly and deeply feared that I would end up like him and it scared me to death. Those fears returned all right with income problems and the shock my dad’s passing away caused in my little life. I saw him today. I turned round the corner as he was emptying some huge bag of high class garbage into a container, obviously a chore he was asked to do for someone in exchange for an equivalent of a dollar or two, or a sandwich for that day. It was a sad contrast to see him, a man in a clearly very neglected state and torn clothes, throwing away very expensive waste items. My heart sank as I said hello to him, he wouldn’t notice me otherwise as his vision deteriorates heavily as well. He knows about my dad from my mom, so he asked how we were doing. We were standing in front of that container, the sky was heavy and black as the depths of my soul, and this person who’s lived genuine hardships asked me if I was coping, when the right question would be if and how he is coping. I said I was managing, somehow. He looked firmly at me and smiled, saying: “Hey, hang in there. You have to. Got it? HANG IN THERE.” Then he waved goodbye and wandered away as I stood in disbelief. Honestly speaking, what does he have to hope for in this world? He is doomed to soon lose even the bed he’s sleeping in when bills accumulate again, this time to the point of no return. He would have all the right to totally give up. This person who has sometimes hard time getting simple things wanted to make sure I got it that I had to hang in there. Ashamed, sad, amazed, humbled, shaken… that’s how I felt returning to my realistically really modest home, I have no idea how it feels to be wealthy or even just well off. I looked around me and thought… what would he give to exchange places with me and have my life, with all its hardships? Probably everything. It would be for him as if somebody had taken stars of the sky and spread them in front of his feet. Or it would equal touching that distant sky above us. He would be extremely happy. And I’m so miserable. How is it possible for people to differ so much in the same circumstances? No matter what, if somebody like him tells you to hang in there, then you really have to do it. Such messages can’t be ignored. It’s not the first time that I feel this strange distinction between the storm going on in my inner world and the serenity of the reality that surrounds me. Things in life are very plain if you manage to see them for what they really are, objectively, detaching yourself from the emotions you attribute to them. No matter how hard we try to run, fight, push, pull, squeeze, beg, drive ourselves crazy in some desperate attempt to change the course of imminent things,life blankly follows its own rules. And life’s rules are much bigger and stronger than that small dose of electrical energy that’s pulsating in our bodies while we’re still technically alive. Substantially speaking, life is simple. Life doesn’t divide things in good and bad, it doesn’t judge or analyze, it never gets happy or sad over its own actions. There are processes that have to be carried out from the beginning to the end, and life infallibly fulfills that mission. It does the work, but it doesn’t care about it. It’s us people who care, not life. This realization is one of crucial moments in dealing with panic disorder, that split second when you realize that you’re having all sorts of scary thoughts, panicking, drowning in a glass of water… over actually nothing. Nothing is going on that makes you feel that way, it’s just how you feel about something you want to do or situations ahead of you. Plainly put, it’s not life, it’s you. Understanding this can make the difference between suffering a full blown panic attack and halting it when it made only half of the damage. After some hard practice, it can truly work. When it comes to real life events, it’s a lot harder, even though the principles are almost exactly the same. My dad got sick at some point in time. When exactly and how, we’ll never know. His cells grew and divided for many long years without particular problems. Or if there were problems, his body had ways or means to fix these mistakes. And on he went this way till some day when some big, irreparable mistake happened. Cells continued to grow and divide, healthy ones in their usual way, unhealthy ones in some fast, vicious, mistaken way. This process continued as he was living his life calmly and peacefully, oblivious of what was going on inside. When he got the symptoms, it was already too late. What we witnessed was only the last phase of that for a good reason called malignant process. Bad cells grew right through the most important clusters of good cells and ended my dad’s life, dying instantly in the battle they so triumphantly won. And then there was silence. Simple, bad, dead silence. It happened, it had its course and then it was finished, life did its job. All the rest – all my physical and mental struggle, all the images that still come back in horrific flashbacks day and night, all the tears, all the sorrow, all the questions (why this, why him, why us…), all that denial, anger, bargaining, depression and occasional painful acceptance, those are all just human created extensions of this story. The story ended more than a month ago and I’m still shaken inside and it’s still shaking every thing in my life, I’m still struggling and drowning in that small glass of water… but there is nothing in my reality OF TODAY that’s provoking this. The only difference between this situation and a panic attack situation is that I have a reason for my feelings, while panic has no foundations in reality. There surely is a reason, but it’s already sealed as a past event. I can’t change a thing about that reason. I can’t travel back in time and change things that haunt me as being something that I could have perhaps done differently. I can’t escape to future either to run away from the intensity of this recent loss. The only thing I have is now, this present moment. And as nothing bad is going on right now (at least nothing I’m aware of), it turns out that I shouldn’t be so shaken. People who manage to put this truth into action are on a good road to mastering that Zen’s full embracing of the reality in the present moment. There is nothing bad about holding onto this truth, it can only spare you from all that pain that actually serves no other purpose than to harm the person experiencing it. Yet it’s so hard to make this detachment. Is it guilt, the feeling that you’ll forget the person you loved very much if you no longer experience pain? Or perhaps the failure to put this into action is some sign of emotional immaturity or instability? I don’t know the answer. What I know though is that I’m still very much battling with myself, paradoxically still fighting against a finished illness, worrying constantly, reliving the details and painfully looking for the exact thing that went wrong in the first place. I do the chores of the day, I suffer, I live, I suffer, I sleep, I wake up and I suffer again. And none of this ongoing agony is real now, there is stillness of an autumn night outside, occasionally interrupted by rain and blows of wind against the windows. There are no battles out there, not any more, battles are all inside. But there is a huge step between understanding and implementing this. Today was October 12th. It’s been exactly a month without dad around. Am I doing better? No, not really. Has it started sounding real? No, it hasn’t, it still makes no sense at all. It’s as if somebody pressed the permanent pause at the end of that accelerated horror story movie of the battle for dad’s life and now time flows in some badly directed nightmare that I still wish could end any time. Have I moved on? No, I haven’t, I still catch myself begging him in my mind to come back even though I know very well that he never will. I almost decided to quit blogging for good. Because you know, somehow I think that I shouldn’t complain that much or all time. Everybody lost somebody. Everybody will lose somebody extra special and handle it better than I do I suppose. On the other hand, I am who I am and my grieving process is uniquely shaped in my own way, I can’t be here talking about good and cheerful things right now. I’m well aware that it pushes people away and that all this long lasting “rant” is the best way to lose even that couple of tiny friendly bonds I managed to create (which I’m afraid has already happened). But I can’t pretend. I’m tired of pretending, I’ve been doing it for years and years, for almost as long as I remember, faking that my days are the same as the days of the majority of people out there who live without anxiety issues. Call it the fear of stigma, desperate desire to fit in, struggle not to lose the last good standpoints I badly need if I want to survive any longer. Whatever it is, one thing is certain – I’m not crazy or delusional or any sort of threat to anybody, I just have anxiety issues which have filled my soul with lots of pain and solitude for so long. That pain is there, the same as always, it is just multiplied many times and worsened by the grief that’s been haunting my days for weeks and weeks in a row. When I wanted to quit, I remembered the title I gave to this unfortunate blog of mine – “Thinking diaries”. Even though it was created with quite a different idea, and even though it should have been a place for interesting contemplations on various issues, it took a completely unpredictable turn… but it was still meant to be a diary of some sort. Diary entries aren’t always cheerful or fun. Diary writers are not all and always bursting with optimism. This is my life, and such should be my diary as well. I almost opted for writing it back on paper again in order not to choke or bother other people out there any more, but it would be hard to fit in things like images or sounds into a palpable version. So, all in all – if the negativity is too much for you guys out there, what can I say – there are plenty of other places where sun shines brighter than on my pages. As for those who will still stick with me “in sickness and in health”, one big thank you from the bottom of my heart. Back to October 12th – in the Christian Orthodox religion to which I belong, this is a special, festive day called Miholjdan, dedicated to the Saint Kirjak, who among other things spent his life healing the sick and unfortunate people. This day is also dear to many Serbian people, marking the period of Miholjsko summer, equivalent for the North American Indian summer. It is typical that around this date summer briefly returns for the final goodbye, even though the autumn has officially started three weeks ago. It’s no different this year as well, daily temperatures are around 80 degrees and will stay that way for the next couple of days. This year Miholjdan came immediately after the day dedicated to the dead – in the Orthodox religion, there are four such days in the year, they are called Zadušnice (za dušu – for the soul) and they are always on Saturdays – the first day of the dead in autumn this year was October 11th, and the second one will be on November 1st. You are supposed to visit the graves of your deceased family members on these dates, light candles, bring flowers, take care of the grave, remember the ones who have left us. I was at the cemetery yesterday. I somehow always feel that wherever I go, my father will appear somewhere out of blue and tell me that none of this was real, that he is well and that he’ll be happy in his garden as he has always been. I went to the cemetery, my mom went to the garden to take care of some of the last fruits of dad’s this year’s labor. His last labor as it turned out. It’s horribly sad to find all his stuff there as he left it and the ground slowly succumbing to neglect, weeds and silent abandonment. Each and every thing there was made by his hand or placed where he decided things to be. It requires lots of work and the kind of strength me and my mom don’t have to keep that garden living. Yet it is still unimaginable to me to let someone else take over that little piece of land, destroy everything he made and turn 30 years of dad’s work into dust. It’s still too early to decide. She “looked for” him in the garden, I “looked for” him at the cemetery. He was nowhere to be found, there were just evidences that he once walked on this Earth and shaped some of its parts in a certain way. We ordered his picture for the tombstone and arranged for the letters to be carved in, his name and years of birth and death, right under my grandma’s picture and name. I arrived yesterday afternoon and there it was, almost completely done. It made me cry in some good way. It was beautiful, if such things can be called beautiful. He smiles from that picture the same way he does from the photo I hanged here previously, as if he were about to open his mouth and say something at that very instant you look at him. I lit the candles and as I was moving away, that light in the dusk accompanied by the light of other candles all over that nowadays huge cemetery made some very special effect on me. It was almost some kind of blessing, some special peace that was spreading all over that huge, flat, open space. Mom brought home some potatoes, parsley, carrots, a couple of pears and some of dad’s favorites quinces. They have that special, one of a kind smell of their village childhood when old women traditionally kept quinces on the cupboards in autumn and winter which filled the air with the last breaths of that year’s fruits of the nature. I remember my grandma and later my mom making that extra special quince jelly with nuts that we called kitnikez, word distorted from German Quittenkase whose tradition of making these sweets we inherited and adapted back in the times of the military occupation. Having been a diabetic for many years, dad turned over time to the stewed mixture of quinces and sour apples (compote) with no added sugar, but this imposed change in habits didn’t changed his love for his extra special quince trees. There are almost no apples this year, but he lived to see last year’s apple outburst – he gave out kilos and kilos of apples as presents to everybody we knew, that was his last goodbye with giving out healthy fruits he produced with so much love and care. He never sold one thing he made in that garden, he never knew how to make money. If the state hadn’t given him salary for his job as a doctor, he would have cured people for free. It was all about love and giving out to the world with a smile in his life. He was quite a unique person, and I am not saying this because he was my dad. It still feels weird to use past tense when I speak about him. As for the candles at the beginning of this post – all those who can’t visit the graves of their loved ones, either because of illness, distance, or simply being busy are more than welcome to light candles for the dead in any nearby church, both on Saturday and Sunday. 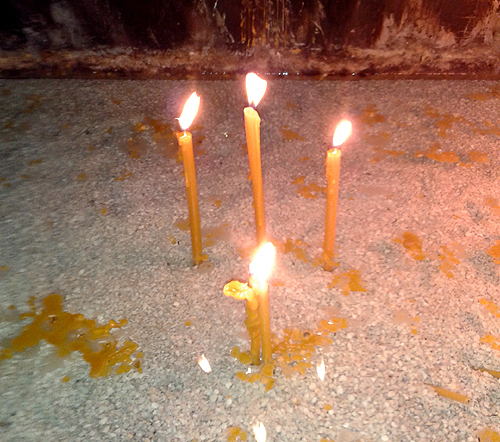 Even though I was at the cemetery yesterday, I felt the need to go to the church today, especially because it was both Miholjdan and a month after dad passed away. I always used to light one candle for the grandma and another one for “all the rest”, other people usually light just one candle for all those who are missing from their lives. Now I lit one for the grandma, one for the dad, and one for everybody else, dad’s candle is the one in the middle of that photo dominantly depicting three candles. 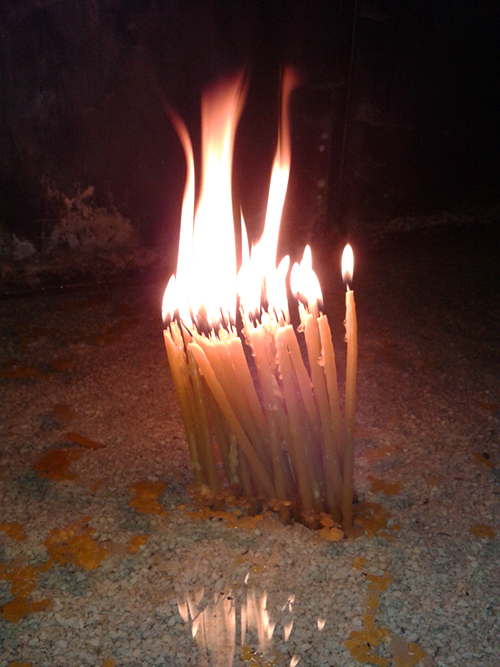 Then something strange happened, there was this very old lady that came with a handful of candles, stood right next to us and started lighting them one by one, while as we say “attributing” each one of them to a certain person. My mom said – my goodness, look at that flame… and I said – mom, my goodness how many dead people though… Then I remembered what my grandma’s best Belgrade’s friend who is 95 and still alive said – I don’t know what’s worse, to die early or to live long – if you live for a very long time, everybody you’ve ever known will be gone and you’ll be still there to be aware of that. I’m sure that the old lady that lit these candles would agree with her. We stood in silence, watching the flames and it was again a moment of piece in all this storm. May all that people remembered this way rest in piece and may these candles light their path, till we all meet again some day. Do I still exist for you?